Dai-ichi Life has been assisting the Vision of Contemporary Art (VOCA) Exhibition at the Ueno Royal Museum since its premiere in 1994 to help foster and support young artists under the age of 40 who have a bright international future in the field of two-dimensional arts. Previous exhibitors have included Miran Fukuda, Miwa Yanagi, and Mika Ninagawa, making this initiative a gateway to success for up-and-coming young artists in recent years. The 25th VOCA Exhibition in 2018 featured the works of 34 young artists from across Japan and particularly excellent works were presented with an award. Dai-ichi Life not only sponsors the exhibit each year, but it also stores the works of VOCA Prize and VOCA Honorable Mention prizewinners and regularly exhibits them in the first floor lobby of its Hibiya Head Office and at the Dai-ichi Life Gallery (also at the Hibiya Head Office). In addition, the Dai-ichi Life Gallery provides continual assistance to prizewinners by exhibiting their individual works and providing a place for prizewinners to introduce their artistic activities after winning the award. Such activities were recognized and in 2000 the Company received the Company received the Japan Mécénat Award from the Association for Corporate Support of the Arts, which honors companies and foundations that contribute significantly to the promotion of arts and culture. Dai-ichi Life supports the Triton Arts Network as part of its regional activities to build an affluent next-generation society. 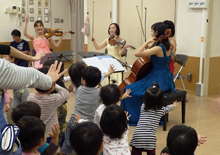 Triton Arts Network engages in outreach work whereby they organized musical performances based out of the Dai-ichi Life Hall (Tokyo)* to provide high-quality music to the residents of welfare facilities or children who find it difficult to attend musical performances on a regular basis. These performances enrich children's sensibilities and also provide therapeutic experiences for the elderly and unwell. A feature of these events is how individuals, NPO staff, local supporters and volunteers from Dai-ichi Life provide support in both moral and practical forms. In recognition of this work, Dai-ichi Life was awarded the Mecenat Prize from the Association for Corporation Support of the Arts in 2009, and in 2017, Triton Arts Network received a special Tokyo Metropolitan Government Social Contribution Award for Furthering the Development of a Mutual Assistance-based Society from the Tokyo Metropolitan Government. 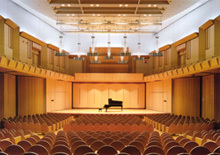 Dai-ichi Seimei Hall hosts concerts that can be enjoyed by a wide range of customers, from "Classical Music with Children" that can be enjoyed by parents together with their children, "Daytime Musical Stroll" that includes talks from performers and composers, and Hareta-Umi ("Calm Seas") Orchestra led by Tatsuya Yabe. * Dai-ichi Seimei Hall was opened in 1952 and has greatly contributed to cultural promotion and advancement in post-war Japan. In 1989, the hall was closed for restoration and remodeling work after 37 years of serving audiences. In 2001, the hall was reopened in Harumi, Tokyo. Dai-ichi Life has sponsored the very first competition held in 1983 and provided its clay tennis courts located in Sengawa, Tokyo as the event venue, based on its shared belief with the Japan Tennis Association in the importance of strengthening athletes from a young age in order to develop the international stars of tomorrow. Exciting games are played every summer. A total of 128 players compete to see who comes out on top. The event teaches them values such as fairness, good manners, and feelings of gratitude. The year 2018 marked the 36th time this competition was held, and over the years it has produced some of Japan's most famous tennis stars, including Kei Nishikori, Makoto Ninomiya. In recognition of this long-standing competition, in 2014 we received our third Special Corporation Prize from the Japan Tennis Association.